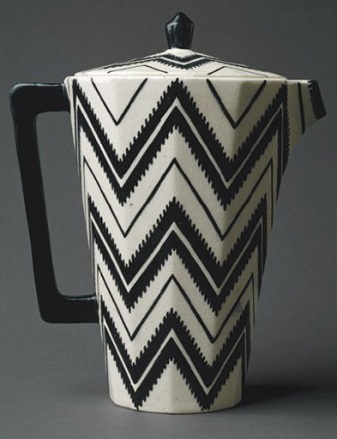 Art Deco, which became the dominant style in the decorative arts between the First and Second World Wars, never had an ideology, let alone the paraphernalia of manifestos and propaganda that surrounded contemporaneous movements such as Walter Gropius's Bauhaus and Le Corbusier's Functionalism. Evolving in a diffuse and unplanned manner from Art Nouveau, and being strongly affected by Cubism and Futurism along the way, Art Deco's characteristics - streamlining of forms, geometrical motifs of zigzags, triangles and circles, bright, uncompromising color schemes - were established well before the style even acquired a name, which it finally did as a result of the first post-war, large-scale decorative arts show, 'L'Exposition Internationale des Arts Décoratifs et Industriels Modernes', in Paris in 1925. The fact that Art Deco lacked the conceptual baggage of other design movements did not, however, prevent it from becoming loaded with national and political significance. The outstanding example of this is to be found in Czechoslovakia, which produced some unusually distinctive and attractive Art Deco works, as is confirmed by a fascinating exhibition at Padua's Palazzo della Ragione - the city's splendid medieval town-hall - 'Art Deco: Bohemia 1918-1938' (which runs until Dec. 22). In 1997 the show will go on to Montecatini Terme, near Florence, then Brussels and Barcelona. This temporary show and its first-class catalogue are especially important because most of the exhibits in this rich collection of sculptures, panels, glass, ceramics, metalwork, woodcarvings, lace, carpets, tapestries, furniture, clothes and even hats, bags and shoes - which conjure up an entire epoch in the history of central Europe - come from the Prague Museum of Decorative Arts, which at present has no space to display the objects permanently, depriving the city of what could be a major attraction, not to mention an invaluable documentary resource. Full-blown Art Deco and the First Czechoslovak Republic were born more or less simultaneously after the end of the First World War and the break-up of the Habsburg Empire. Unsurprisingly, in their enthusiastic search for new national idioms, Czech artists and craftsmen embraced many elements of the up-and-coming-style of the moment. Indeed, in these early years Art Deco almost achieved the status of 'official' First Republic art, with the red, blue and white of the national flag being favored colors in all kinds of artifacts. For a small country, Czechoslovakia had an astonishing number of specialized schools, over 280 in all teaching in both Czech and German, and the level of craft training and skills was high. Thus, though Art Deco later became associated with banality, mass production and mediocre quality, many of the objects in the show provide ample evidence of thoughtful design, intensive hand-working and meticulous finish. Some of the chunky decanters and glasses, cut-glass figurative designs, porcelain, ceramics, wooden toys and jewelry, to take but a few examples, would still be eye-catching today in any context. And the lace-work, which includes a circular yard-and-a-half-diameter marvel 'Little Sun' (which, along with a considerable number of other works also on show at Padua, won justified accolades and prizes in Paris in 1925), is stunning. The only artist to be given a entire section to himself is the sculptor Jaroslav Horejc (1886-1983). He was decisive in shaping an unmistakably Czech Art Deco style. The range of materials he worked in was vast, as were the types of pieces he produced - apart from his sculptures, these included jewelry, medals, coins, ceramics, glass, textiles, furniture, books, stage-sets and costumes. Although an artist of such individualism that his work transcends a simple Art Deco label, his career is in many ways a paradigm of the fate of the style and the effect of politics on the development of 20th-century Czech art. In 1939 Horejc was due to represent Czechoslovakia at the New York World Exhibition with an large relief, made at the Josef Riedl glass workshop in Polubný. But in an episode of Nabokovian tragic-absurdity, by the time show was about to open, having been swallowed up Germany, Czechoslovakia had ceased to exist, and Horejc could no longer take part in the show. After the communist takeover of the 'liberated' Czechoslovakia in 1948, Art Deco was denigrated and suppressed along with many other aspects of the First Republic, as bourgeois and decadent, and Horejc condemned to continue working in total obscurity. Happily, in 1971, the Prague Museum of Decorative Arts did succeed in organizing a personal retrospective for the artist, the only one in his life, for his 85th birthday (when the New-York bound glass bass-relief was unpacked from its crates and assembled for the first time). Since his death not only Horejc but also Art Deco have undergone a process of 'rehabilitation'. Much of the renewed interest among younger Czechs in Art Deco's jazz-age, colorful style was stimulated by their detestation of the puritanical, drab, shoddy, monochrome brutalism of the totalitarian visual environment. And, since the fall of the old regime, there are signs that an almost official programme for the revival of Czech Art Deco is afoot. The classic Mayor of Prague's Reception Rooms at the Central City Library, realized by the architect František Roith in 1928, which were for decades locked up and hidden from public view by the disapproving authorities, have been thrown open again, and President Václav Havel himself has set his seal of approval on the previously-proscribed style by commissioning neo-Art Deco interiors designed by Petr Malínský and Borek Sípek for his refurbished private villa.